“Mommy, I need a rain suit,” Lily told me after her first week of preschool. It was on the list of supplies her teachers had given me, but we were busy during September settling into school routines and finding everything Sunshine needed for Kindergarten. Plus it wasn’t rainy yet—we had a lovely sunny fall here. Well, the rain appeared a few weeks ago and Lily came home from preschool one day in her spare clothes because she’d gotten all muddy and had to change. So I went online looking for kids’ rain gear and found Oakiwear. Oakiwear started when a mom went looking for durable, affordable rain gear for her twin boys and couldn’t find it. Her philosphy is “If we truly wish to get kids active again, we need to provide them with the right gear at an affordable price to open the door to new possibilities in outdoor exploration.” Sounds great! 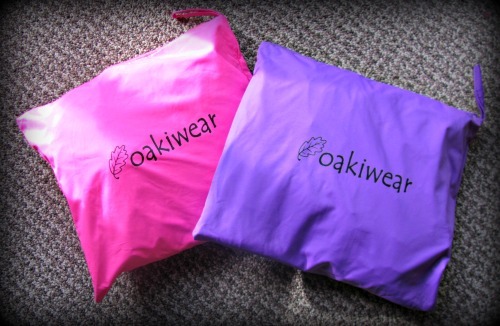 Oakiwear sent us two rain suits to try out. Lily kept asking me when they were going to arrive and was super excited when we finally picked up the package. I was really impressed from the start. The rain suits came in a neat little storage bag, which will be great for keeping my closet neat or storing their rain suits at school. The colours were bright and vibrant—actually, if I got them again, I’d get both in pink, because it’s bright and easy to see when we’re out hiking. The rain suits have a drawstring elastic around the waist that you can tighten to fit your child. Both the wrists and the ankles have a super soft neoprene cuff that felt so comfy (I wish my rain coat had cuffs like that!). I tightened the Velcro ankles around Lily’s rubber boots and knew she’d stay dry no matter how many puddles she jumped in. The knees are reinforced with an extra patch for kids who like crawling around outside. Lily wore hers while we were running errands on a rainy day, and the way her reflective strips lit up made me smile. The only problem we had was the size. I found the size chart on the website confusing, even after I tried to measure Sunshine and Lily. I wanted a height for the rain suits. When I asked, I was assured that the rain suits usually fit the kids’ ages, so I went ahead and ordered the suits for their ages—3T for Lily and 4/5 for Sunshine. However, I forgot that Sunshine and Lily swap clothes all the time and Sunshine is only two inches taller than Lily. The pink 3T rain suit fit both of them perfectly; the 4/5 was huge on Sunshine. Now, I’m waiting for some rainy days to take the girls out with their rain suits. 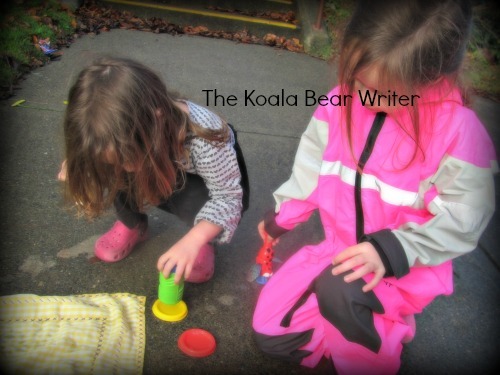 Sunshine’s class is going to Goldstream this week to see the salmon run and I’m glad she has her rain suit, because it’s usually chilly and wet there. Now I know she’ll stay dry and warm while she’s tramping around with her friends (even if she jumps in all the puddles). If you live in a rainy place like we do, check out Oakiwear’s shop. Currently many of their products are on sale. You can also find them on social media (and check out their great collection of articles on Pinterest) or get gift cards (for that outdoor-loving child on your Christmas list, perhaps?). Note: if you live on or near Vancouver Island, you can find Oakiwear products at Cedar Tree Children’s Outfitter and save on shipping! 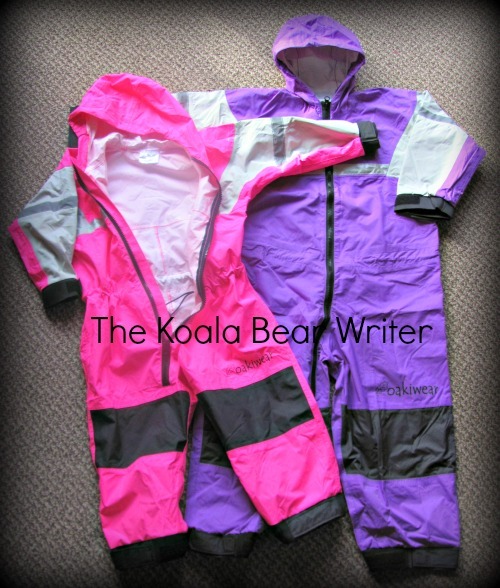 I received two rain suits courtesy of Oakiwear; all opinions expressed are my own. Oh, a full body suit for rain (and mud) is *awesome*!! I’ve got to find one for the nephew, as he loves puddles, lol! Love that they are full body – that is amazing!